A short list of influential hits that propelled Nintendo's system up the sales charts. After seven mostly glorious years, Nintendo's DS finally slowed down. 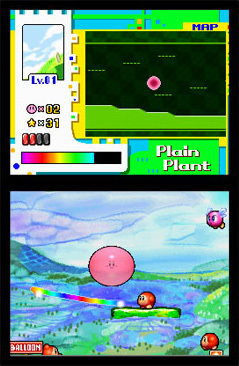 With 3DS on the rise, its dual screen predecessor will bow out gracefully with a handful of games (Kirby Mass Attack) on the horizon. Creating a "best of list" will prove extremely difficult, as the DS played host to a bunch of high profile titles that helped the portable defeat Sony's PSP, despite featuring less powerful technology. If anything, it proved the old saying that software drives hardware. That said, although the DS has a surplus of quality games, a select few catapulted the handheld into millions of gamers' hands. On that note, the following titles aren't necessarily the best DS games of all time, but were instrumental in putting Nintendo's system on the proverbial map, while perhaps resurrecting old genres and creating new ones. Nintendo was instrumental in resuscitating the video game industry in the 80s following the infamous crash. Similarly, the company breathed new life into the concept of virtual pets, after it seemed the craze had fizzled with Tamagotchi. 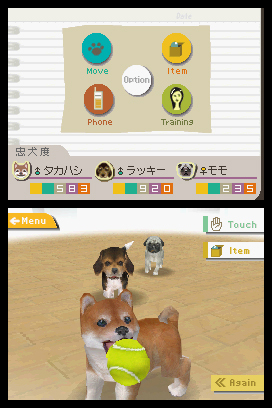 Nintendogs was far more advanced, with lifelike puppies, a wide assortment of accessories and toys, voice commands and touch screen interaction, all of which went far beyond what consumers had seen before. Not only was the game a huge commercial success, but it also reignited the virtual pet phenomenon, as scores of third party publishers released copycat games across multiple platforms. To say the 2004 DS launch lacked pizzazz is a huge understatement. The system itself was bulky and unattractive, while the launch games (Super Mario 64 DS excluded), failed to excite the public. 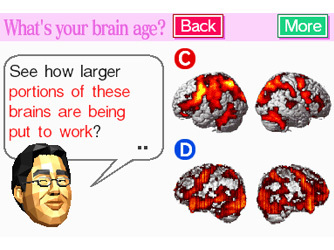 Then, out of nowhere, came Brain Age, a quirky title that claimed to improve a user's mental toughness through a series of exercises designed by neuroscientist Dr. Ryuta Kawashima, who also served as the game's talking head (literally). We still don't know if said exercises sharpen a player's mental acuity, but one thing's for certain: Brain Age took Japan by storm and was also a success in the West, spawning a sequel while inspiring other companies to release tons of imitators built around the same concept. Sure, franchise mascots like Mario, Kirby and Link were instrumental in the DS' success, but without Brain Age, Nintendo may have lost significant ground to Sony in the handheld war. We had visions of an operating game the second Nintendo unveiled the DS. Thankfully, Atlus delivered with Trauma Center: Under the Knife, which tasked us with repairing broken bones, removing tumors and fixing gunshot wounds. The developers took liberties with the science (the lead character, Derek Stiles, uses magic to heal), but the game was instrumental in showcasing the DS' abilities, proving there was more to the touch screen than simple tapping games. 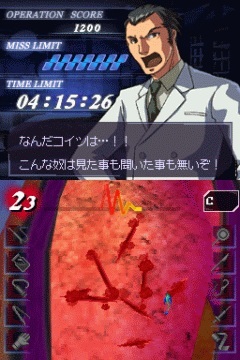 Much like Trauma Center, Kirby: Canvas Curse played a key role in cementing the DS' legacy. Instead of relying on mini games, Nintendo created a wonderful 2D platformer where players direct Kirby by drawing along the touch screen. In fact, the game uses the stylus exclusively. Not necessarily the highest selling DS title, but definitely one of the system's most important and critically acclaimed. Before releasing the Wii, and when discussing the console, Nintendo constantly referred to a blue ocean strategy, whereupon which the publisher hoped to disrupt the video game market with a never before seen product and games. That philosophy carried over to DS, with a series of titles designed to attract casual and non-gamers, Personal Trainer: Cooking being one. It's essentially an interactive cookbook featuring 245 different recipes from around the world, complete with step-by-step instructions, calorie information and cooking timer. 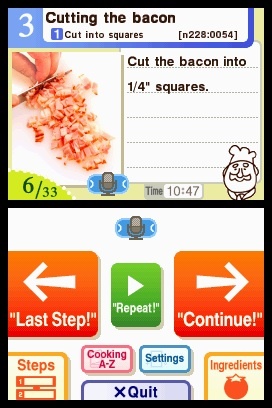 Nintendo improved upon the formula with the superior America's Test Kitchen: Let's Get Cooking (released in 2010), but Personal Trainer: Cooking was the start of something great, proving these portable systems go beyond video games. 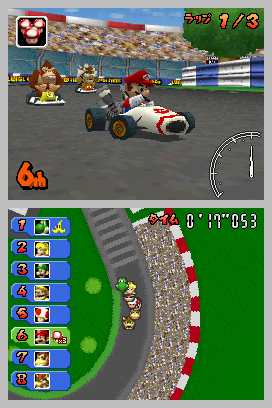 There were many reasons to purchase the DS Mario Kart that went beyond puttering around tracks and hitting opponents with turtle shells. Not only did it have 3D graphics, but Nintendo also let players design their own decals and slap those suckers onto the karts. The biggest feature, without question, was online play. For months, critics speculated whether Nintendo would deliver true online gaming in a DS title, and the company delivered spectacularly, opening the door for future online enabled games like Metroid Prime Hunters and Call of Duty: World at War.